In a previous post I wrote about the Titanic as an example of disaster of project management, drawing from a conference I attended. At the end of the post I reminded the theory of safety in systems seen as layers of cheese with some holes in them. The speaker did not enter into risk management, but rather in communication, teamwork and leadership, nevertheless she acknowledged the side of risk management to the case. 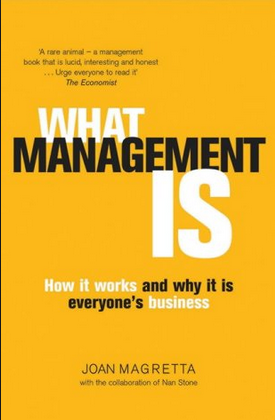 “What management is”, by Joan Magretta. I place myself the same question again: Have we progressed since then? And again: Today we like to think that yes. More requirements regarding safety are put into projects. Regulations are passed to ensure safety. Risk management is used as part of project management to ensure that the kind of decisions taken at the time of the Ford Pinto today they are taken without overlooking the risks behind them. However, I wanted to remark this time the need and criticality of placing safety at the driving seat of cost-benefit analysis, of evaluating risks and mitigations, budget reductions, targets setting, etc. As Charles Munger uses to say all these frameworks and mental models together may create a lollapalloza effect, that is the confluence of incentives and biases acting together may result in the overlooking of serious risks which down the road (after the fact) would seem impossible to have been overlooked (as in the cases of the Titanic or the Ford Pinto). I believe this takes the utmost importance especially in an industry like aerospace, where the words “safety first” cannot be just a phony industry mantra.